This month features an extraordinary woman and dear friend -- photographer Marjorie Salvaterra -- whose evocative images explore the various roles women take on and the raw essence of their inner struggles and inherent beauty. Read our interview below to learn about Marjorie's first book HER: Meditations on Being Female and her insights on what makes creative work resonate with others. Marjorie Salvaterra's images reveal “a fine line between sanity and insanity,” according to Virginia Heckart, Associate Curator of Photography at The Getty Center. Her work was included in the George Eastman House Museum auction at Sotheby's, New York and she was runner-up for the 2009 and 2010 Berenice Abbott Prize for Emerging Photographers. Marjorie's great achievement is as a wife and mother of two. She makes her home in Los Angeles. 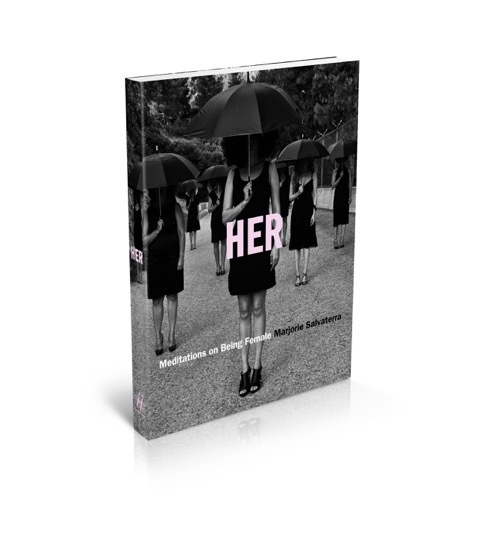 In her stunning collection of photographs, HER: Meditations on Being Female, she explores and challenges the depiction of women's experiences as daughters, mothers, partners, and agents of their own destinies. Karin: What was your way in to photography? Marjorie: Well, I took a few classes in high school and I loved it. But in my head, I already had a plan for my life, so I stuck with that. Then my husband Chris was shooting a movie in Morocco, and I was terrified to go but I ended up going. And I started shooting. Somebody had given us a camera for our wedding, and I just fell in love with it. Just walking around, creating these beautiful images. What was hard was getting home and going, “Oh god, it's so easy to see with new eyes but it's much harder to see with old eyes. What am I supposed to shoot here?” In Morocco it was so easy, everything was new. It was really about finding my voice. Like, what is my voice? What am I trying to say with my work? It was a process. So life was changing up a bit for us... I was a new mom in school and life and health and all this new stuff, and I was just sort of beside myself. What am I doing? I didn't feel like I was doing well by anybody. I was trying to balance being all things to all people. I felt like I was always trying to keep up with everybody around me. I felt like everybody else was doing it better. You know, the moms at school: they looked fancy, I looked crazy. All of a sudden I just had this idea of the women in water. It was my very first shot, 'The Weight of Water' from my HER series. The idea that “one drop of water” was an analogy. The idea of one drop of water throwing off your whole day, basically letting outside forces take over. So I just had that idea for that image. And I thought, “Oh god, how am I going to do that? Get all these women in the water in gowns?” So I just started piecing it together. Buying gowns on eBay, going to used clothing stores. Luckily enough I got enough crazy women to show up and stand in the water in the middle of February. And from there, started a whole series, and really, what I wanted to do with my work; be personal with it. I think it's the same with writing. Take from your own life. Chris and I watch TV shows. We always go, “Oh my god, that had to come from somebody's life, it just had to.” Because it feels so real and so funny. And also being able to make analogies, too. You don't have to tell specifically what happened in your life, but to make it real enough, to make an analogy, to hopefully do it realistically. I also think that the more we're open--the more we give of ourselves--the more people relate. When I was writing, people would say, you have something you can't teach. And I think it's just about being open and emotionally giving of your own craziness. Because I think that's what we respond to in each other; like, “Oh I can relate to this person.” So that's what I try to do with the work. Is that something you had to cultivate or are you naturally open? Yeah, probably way too open. Like in my book, I wrote about my gray pubic hairs. What were some of the themes that you explored in the HER series? Definitely age and gender; growing old and holding on too tightly to things; motherhood; being all things to all people, all the roles we take on as women. I don't know if you have it, but the guilt as a mother, trying to do it all right. Giving your kids everything they need and still being able to take care of yourself. As we age, everything changes. It's holding on to our youth, holding on to this idea of beauty, holding on to this ideal of keeping up with other people. Trying to accept changes, trying to accept our roles. And that we can't do everything and we can't be everything. I get to take out all my frustrations in my work. I think it's sort of therapeutic where I just take images in my life, every situation, and turn it into art. Instead of letting it get to you, turn it into art and let it go. That makes me feel better.